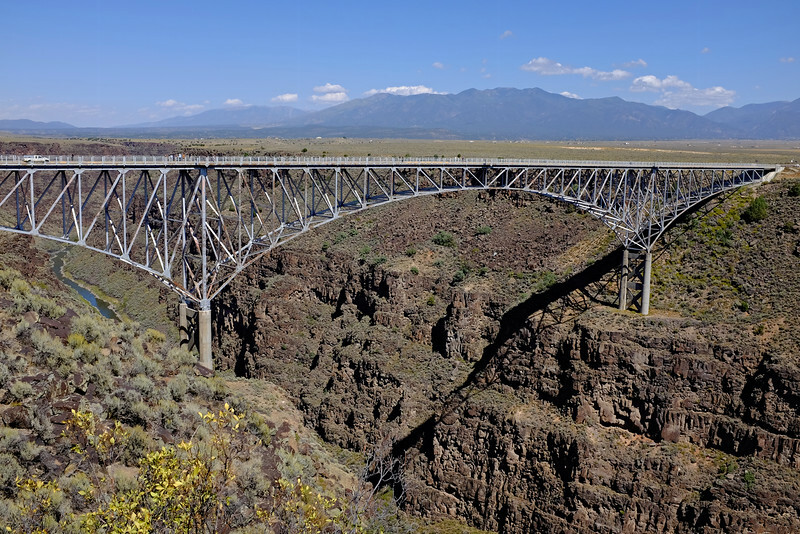 The Rio Grande Gorge Bridge lies about 10 miles northwest of Taos in northern New Mexico. A steel deck arch built in the mid 1960’s, it is the seventh highest in the United States, with the river running 565 feet below. The span is 1280 feet, with a 600-foot long main center section. There are walkways on both sides, with six lookout points. Sadly, there have been numerous suicides, and there are now six hotline phones, one at each lookout. At one of the points there are flags and inscriptions in memory of those who have leapt to their death. Standing on the bridge and looking down as well as out along the gorge, I was filled with a sense of awe and wonder at this marvel of nature. The gorge is known as a rift valley, a separation in the earth’s crust caused by faulting and other earth movements. It begins near Colorado and goes on for some 50 miles, with a depth of mostly 800 feet from rim to river. It lies in a flat valley, with mountain ranges mostly to the southeast. I could imagine early explorers’ consternation when coming upon it, having to travel many miles to find a crossing place. It is often very windy, which added to the trepidation I felt in walking across. Although quite fearful, that did not halt my traverse nor overly interfere with taking photographs. We were there in early afternoon on a somewhat hazy day, so some of the photos show evidence of this. I would like to return again, not only to confront my fears, but for the incredible experience of the vistas, rock formations, and river, and in hopes of better light.